Nestlé recently had in the Chronicle a full page ad going on and on about how many millions of gallons of water they’re now saving in their various state-wide operations and how many more millions they will be saving as they implement new conservation measures. It’s all save, save, save for a full page color ad, without a single word about how much they’re using. I’ve long been wanting to do a post on Prius Bingo to popularize my new game among Prius drivers, but i’d been waiting until i’d actually won a game. I mean, doesn’t the creator of a game typically wait until he has actually won before he starts popularizing the game? And yes, it’s not horseshoes, but i got so close to winning the other day that i thought i’d go ahead and do the post now, thinking that my near victory would inspire others to play the game, win, and send me dramatic photos of their triumph that i might post them here. And besides, if i don’t post this soon, somebody else is going to claim that he invented Prius Bingo and steal my thunder. 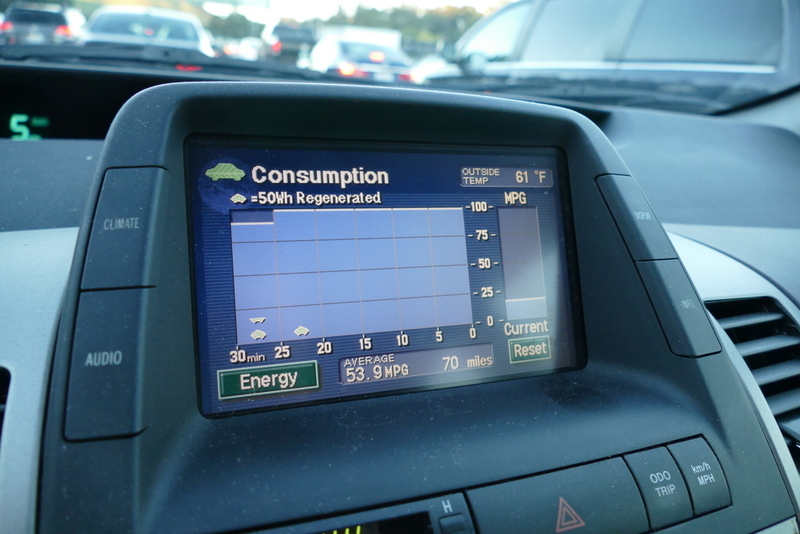 It’s the Energy screen for the 2nd generation Prius, and the relevant portions for the game of Prius Bingo are the six vertical columns on the left side of the screen, each representing the MPG achieved in a succession of five-minute intervals. The screen is read from right to left, with the most recent interval on the right, and as you can see, for the last five intervals i managed to max the MPG rating out at 100MPG. I did not Bingo, however, because for the first interval i got only about 85 MPG and needed another 100MPG interval on the right to push the offending 85MPGer off the left. Alas, conditions had got so bad that by the time the next five-minute interval had elapsed, i showed barely 75MPG. So what’s the trick for winning? Well, you achieve a 100 MPG rating for a bar only by reducing the time spent with the engine running to a small fraction of the five-minute interval of the bar, and you can do this only under two circumstances. First, if you happen to be going down a hill for almost all the period. Or second, if you happen to be ambling along at 25 or so on flat ground so that you are powered almost entirely by the motor. Unfortunately, your battery will hold nowhere near enough wattage to keep the vehicle moving on flat ground for 30 minutes, so you actually need to rely on downgrades to keep recharging the battery. Alas, what goes down, must go up, so right off the batt, success at Prius Bingo depends on finding the right terrain as well as the right road speeds. The reason i almost Bingoed above was a humongous traffic jam that reduced northbound travel for the lower third of Marin County to speeds under 20MPH. We were all in it together, but i, at least, passed the time by entertaining myself with Prius Bingo. One cannot open a sports page nowadays without reading of illegal performance enhancement and other means of gaming the system, and it is owing to this unfortunate aspect of human behavior that Prius Bingo, like all games, must have strict rules. Rule 1. No creeping along on the shoulder. Your Prius must remain within the normal travel path of the road. Rule 2. No impeding traffic by traveling at speeds significantly slower than your fellow vehicles. Obviously if we didn’t have these rules, every Prius would descend the Grapevine on I-5 into the Central Valley at 15MPH and, if he were not run over by several large trucks going 85MPH, rack up a Bingo every time. 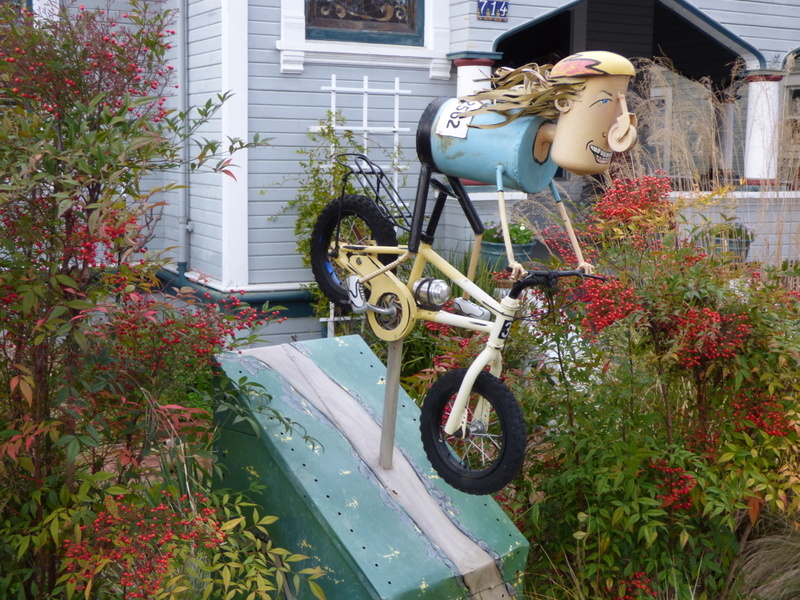 Meanwhile, a Petaluma neighbor also given to unconventional vehicles.